The Appalachian Trail is so well marked it is practically impossible to lose the trail and get lost. AT thru-hikers often buy the expensive map set but mail it home early in the hike. However, on the Florida Trail the maps are an absolute necessity. The FT is not fully blazed along its entire length, particularly on road walks. Even where the trail is blazed, it is possible to become confused. Blazes are often just far enough apart to make you doubt you are still on the Trail. "I haven't seen a blaze in ten minutes...." Also, a lack of regular maintenance and forest fires obscure or destroy blazes. Having an up-to-date map set will keep you on course. 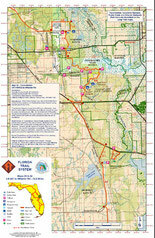 The Florida Trail Association produces a complete map set printed on Tyvek—making them waterproof and tear-resistant. The FT has been divided into 44 sections. One section appears on each side of each map, for a total of 22 maps. At $6 each, a complete map set will cost $132. However, the FTA sells all 22 maps bundled the data book are for $100. Buy the 2015-2016 set here. While we believe the maps are necessary for a successful thru-hike, they are not without a few flaws and can create confusion. These problems are discussed below. The FT is not fully blazed along its entire length, particularly on road walks. Even where the trail is blazed, sometimes the blazes are just far enough apart to make you doubt you are still on the Trail. "I haven't seen a blaze in ten minutes...."
On the Appalachian Trail, the main trail is marked with white blazes and all connecting or intersecting trails are marked with blue blazes. It is pretty simple to know whether you've made a wrong turn or not—if the blazes are blue, you're off the trail. The Florida Trail is marked with orange blazes, and some of the side trails are blazed blue, but then other side trails are also blazed in white, or yellow, red, and more. A species of reddish lichen called Cryptothecia rubrocincta grows on trees in Florida. It can often look like an old, faded, or damaged blaze and cause confusion. As we mention on the forest fires page, Florida wild lands are regularly subject to forest fires, both natural and intentionally set. These fires damage and destroy trail blazes, and it takes time after a fire before a trail crew may re-blaze a stretch of trail. The FTA maps do not always include every detail. For example, in the Ocala National Forest there are a lot of ATV trails (many illegal), fire access roads, and logging roads that crisscrossing the forest. The Ocala map does not depict every single one of these roads. This creates confusion when you need to say, follow a fire access road to a campground to get water and come across a road(s) not on the map. You might turn onto the wrong road or become confused and think you missed the turn when it is still farther up the trail. The data book has more of these landmarks than the maps, and so while on-trail you should cross reference the map with the data book. Wild boar tear up the earth and often seem to do so along the trail corridor. Maybe because the trail is already cleared of brush it's easier for them to root there. In any case, once boar have torn up the land, weeds like Caesar weed quickly grow in the disturbed soil, obscuring the footpath. Many of Florida's ecosystems, including the entire Everglades and the huge Lake Kissimmee, have adapted to a two-season cycle of wet and dry, rather than four seasons. During the winter months the land dries out and lakes recede, only to then flood again in the summer. Maps tend not to make a distinction between whether a wetland is seasonal or year-round. The maps simply show wetland. So how will you know whether you are going to walk on dry ground or slog through a swamp? Typically, if an area is labeled as a prairie that means it is a seasonal wetland and will be flooded in the summer. The US Forest Service has created 4 separate kmz files of the trail you can download and open in Google Earth. Oddly, the hiking trail, road connectors, trailheads and campsites separated into four different files. For your convenience, we have compiled them into one file that you can download by clicking here. The National Forest Service has created an interactive online ArcGIS map. With it you can explore the Trail and get a big-picture overview. Waypoints are limited to campsites and trailheads. You can print your own hardcopies or create PDF maps from the ArcGIS website. However, compared to the FTA maps there isn't much detail or information. Printing maps from ArcGIS is no substitution for buying the FTA maps. The Florida Trail ArcGIS map is also available as a smartphone app. We discuss its features on our electronics page. Similar to the Guthook apps for the AT and PCT, the The Florida Trail Guide app is based on the Florida Trail guidebook by Sandra Friend and John Keatley. The app uses your phone's GPS/location software along with topo maps and Google Maps to determine your location on the trail. This works even when you get no bars. We don't think GPS units should be brought on a thru-hike — it's hard to justify the weight. In addition, since so many hikers are bringing smartphones, it is redundant to carry both a GPS unit and a smartphone. A smartphone's GPS function works even when the phone does not register any bars, so a smartphone will suffice. If you decide to bring a GPS unit, keep in mind that they have batteries that die, software that crashes, watertight designs that fail, and a propensity to sink if they fall into lakes. Do not rely solely on it to navigate and use it in tandem with your old-fashioned paper maps and the data book. Finally, be proficient with your particular unit before starting your trek. 1) If you purchase the Florida Trail Guide by Friend & Keatley, it includes GPS coordinates for some, but not all, waypoints. 2) The National Forest Service has also provided four different .kmz files for use in Google Earth and handheld GPS units. Non-hikers get around in cars and simply have no idea how far something is on foot. Invariably, people give estimates in time, not distance. "It's only five minutes up the road," they'll say. Well, they mean five minutes by car, not on foot. 55mph equals 80 feet per second. We don't walk that fast, and we doubt you do either. So five minutes by car is 24,000 feet, or 4.5 miles —that's over an hour of walking.